The massive photo album pictured above, measuring nearly 14×19 inches, is definitely a rarity and a bit of a mystery. 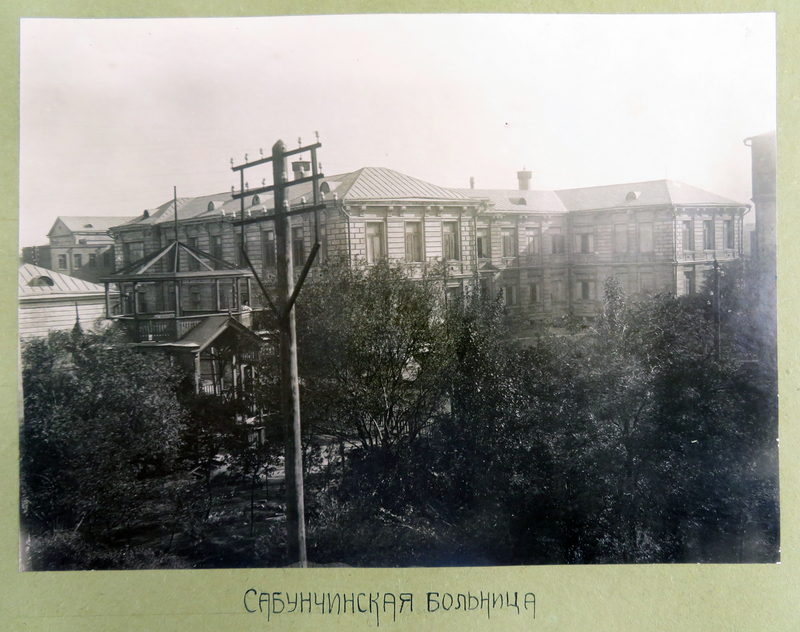 Created in 1922, probably in Baku, Azerbaijan, the Russian language album features 114 photographs (mostly silver prints) mounted on 30 card stock sheets. 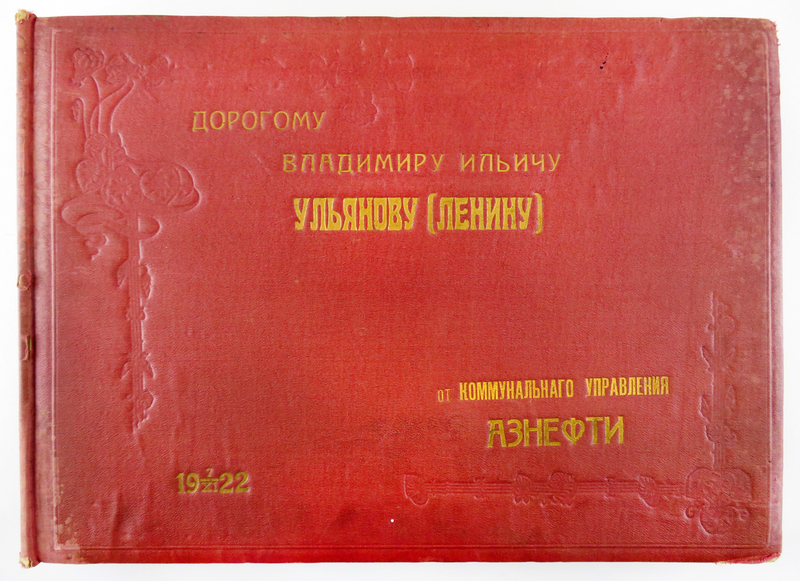 The cover title, (badly) translated as “To dear Vladimir Ilyich Ulyanov (Lenin) from the Communal Management of Azneft'”, indicates that this photo album was dedicated to Vladimir Lenin, then leader of the USSR, from the Azneft commune. But the album wasn’t really a gift for Vladimir Lenin (he mostly likely never saw it himself), it is more like a modest predecessor to the large scale Stalinist propaganda campaigns in which the great leader is thanked for the benefits of the revolution. 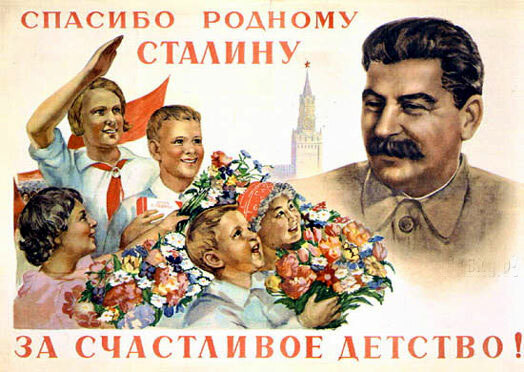 Cult of personality propaganda would reach new heights under Joseph Stalin, this poster text translates as: Thank you Comrade Stalin, for our happy childhood! After a brief (18 month) independence from Russian rule during the Russian Civil War, Azerbaijan would find itself forcibly integrated into the USSR in 1922. As a result, the massive oil reserves outside of the capital city Baku would be nationalized and consolidated under the Azneft name (at the turn of the last century Azerbaijan was producing almost half the world’s oil, and continues to be an oil rich nation today). This album was probably arranged for the workers of an Azneft commune in order to showcase the amenities of a newly industrialized (and collectivized) life under Soviet rule. Though probably made up of mostly oil workers and their families, the (ideal) tenets of collectivization meant that many aspects of material and social life would be provided on the commune including things like education, recreation, health services, and workshops. 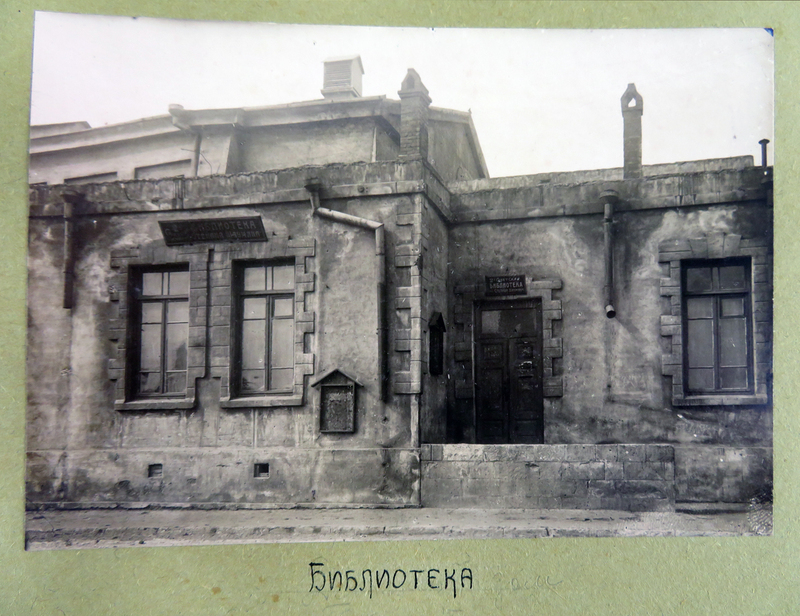 Uchitel’skaya (teachers), faculty of the commune’s school. 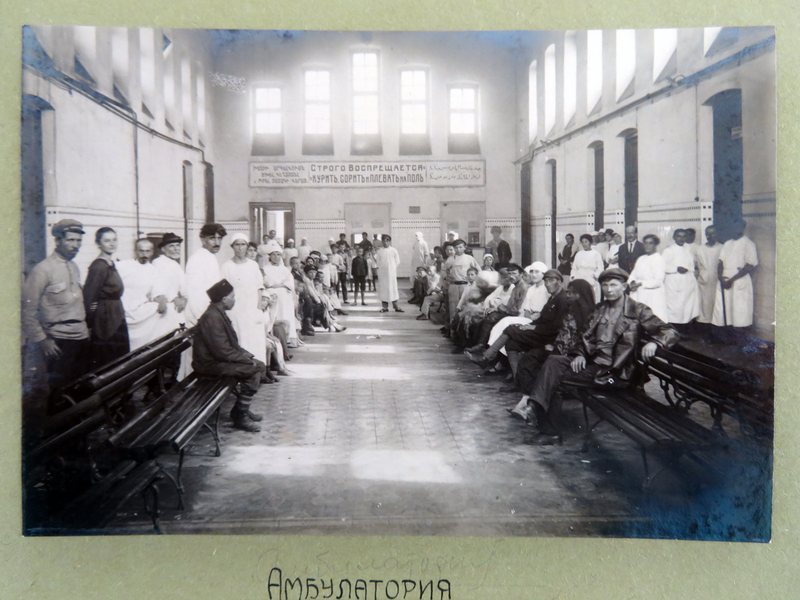 Ambulatoriya (literally a “dispensary”, or small health clinic) Though difficult to make out here, the sign at the back of the room reads: “it is strictly forbidden to smoke, litter, and spit on the floor”; a message that was crucially displayed in Armenian, Russian, and Azerbaijani in order to make sure all patients obeyed the rules (strogo vospreshchaetsya kurit’ sorit’ i plevat’ ya pol’). 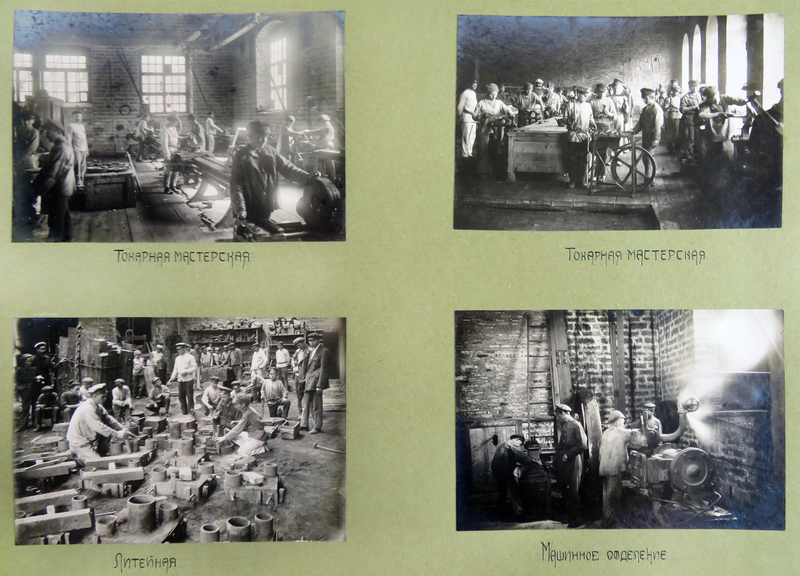 Clockwise from left: Tokarnaya Masterskaya (lathe workshop), Tokarnaya Masterskaya (lathe workshop), Mashinnoe Otdelenie (machine room), Liteinaya (foundry). 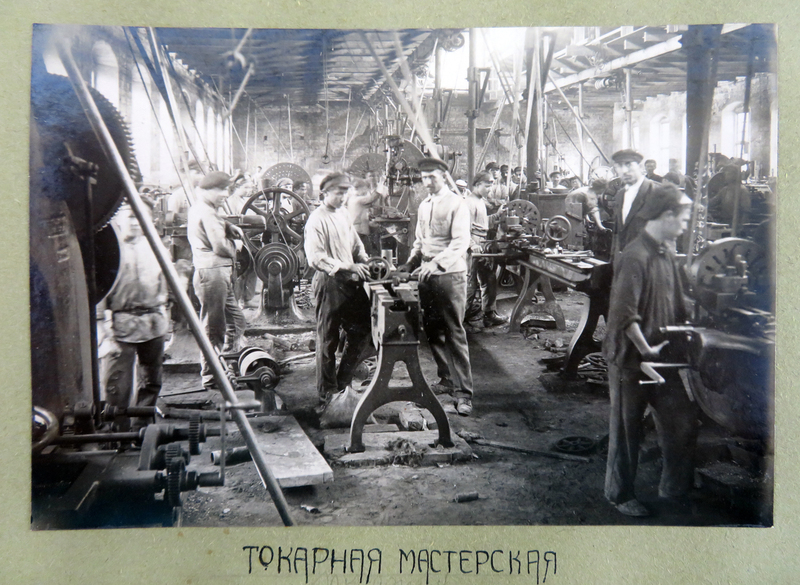 Tokarnaya Masterskaya (lathe workshop), a closer look at lathes. 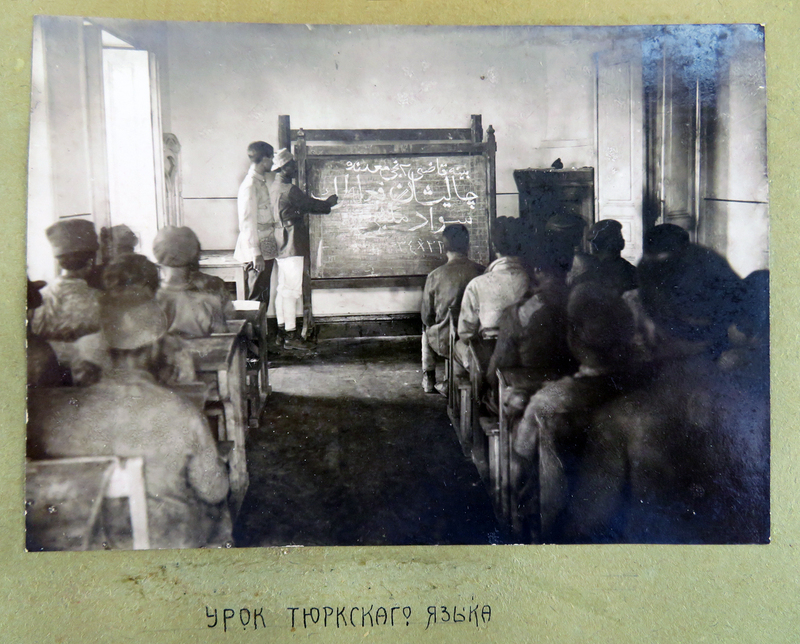 Urok tyurkskago yazyka (Turkish language lesson), here adults are being taught the Perso-Arabic script for “Turkish” (Azeri Turkish) before Soviet authorities would institute a Latin script (1926) and then Cyrillic script (1939). 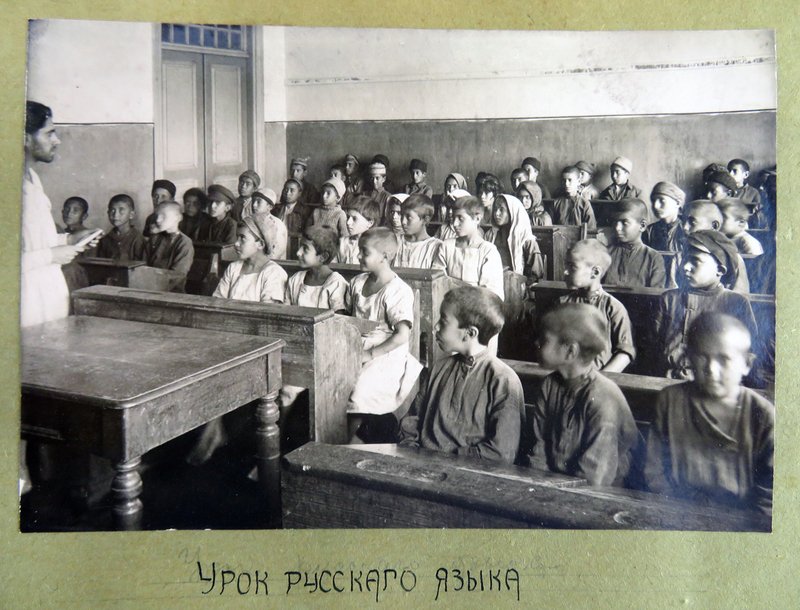 Urok russkago yazyka (Russian language lesson), children would be instructed in both Russian and Azeri Turkish (not shown here). The photo album also depicts life off the commune. Pictures in the second half of the album capture visits to a new hospital in Baku and various sanatoria in Stavropol Krai, Russia; a region well known for it’s climate and health resorts. Perhaps advertising the new found inclusion of the united proletariat into the Russian world of rest and relaxation? Sabunchinskaia bol’nitsia (Sabunchu hospital) in Baku, Azerbaijan. 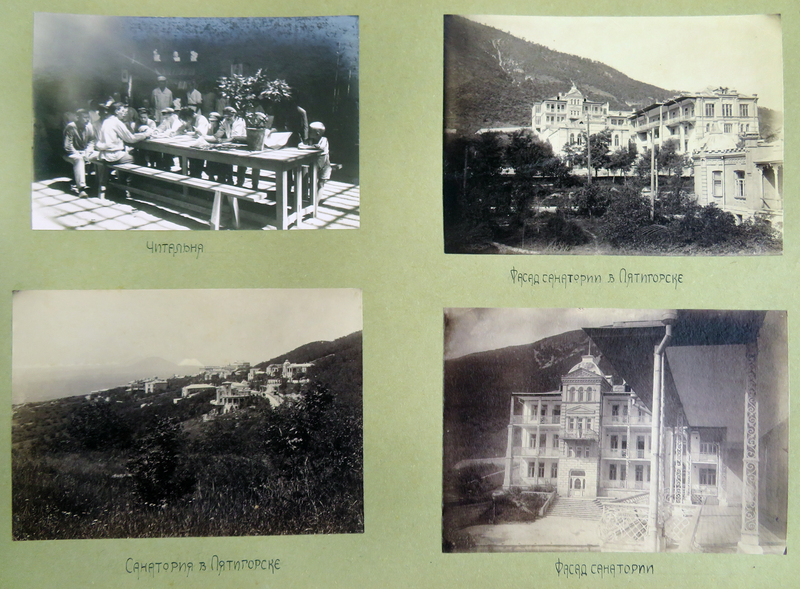 Clockwise from left: Chital’nya (Reading room), Fasad sanatorii v Pyatigorske (facade of a sanatorium in Pyatigorsk), Fasad sanatorii (facade of a sanatorium), Sanatoriya v Pyatigorske (sanatorium in Pyatigorsk). 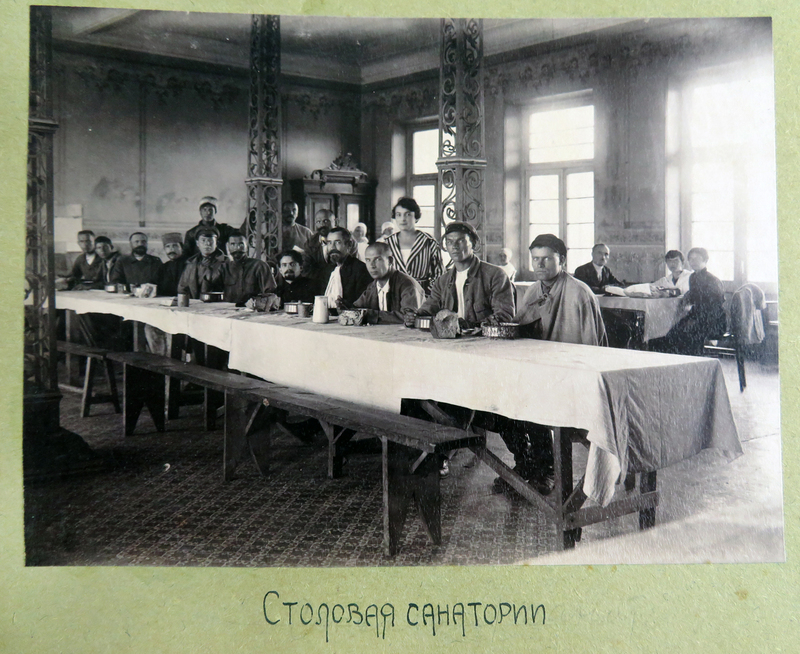 Stolovaya sanatorii (dining room of the sanatorium), a few comrades enjoying a communal dinner. As the handwriting below the photographs makes plain, this album wasn’t mass produced. 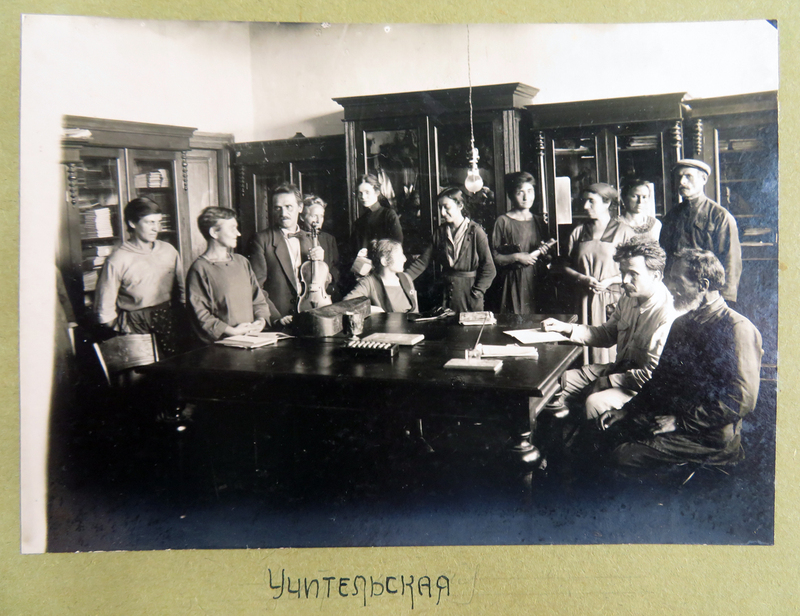 Other Soviet photo albums of this kind are known to exist (later and more elaborate versions would be dedicated to Comrade Stalin), but this one appears wholly unique. We are lucky to have it here at Cotsen so that we can preserve these unique snap shots into a once brave new world that has faded sepia with time. Many thanks to Thomas Keenan, Slavic, East European, and Eurasian Librarian for invaluable insight into what this item is. All misunderstandings and mistranslations are my own. Events and items in the collection of Cotsen Children's Library presented by the curatorial staff. Where in the World is little Holly Healthy!? 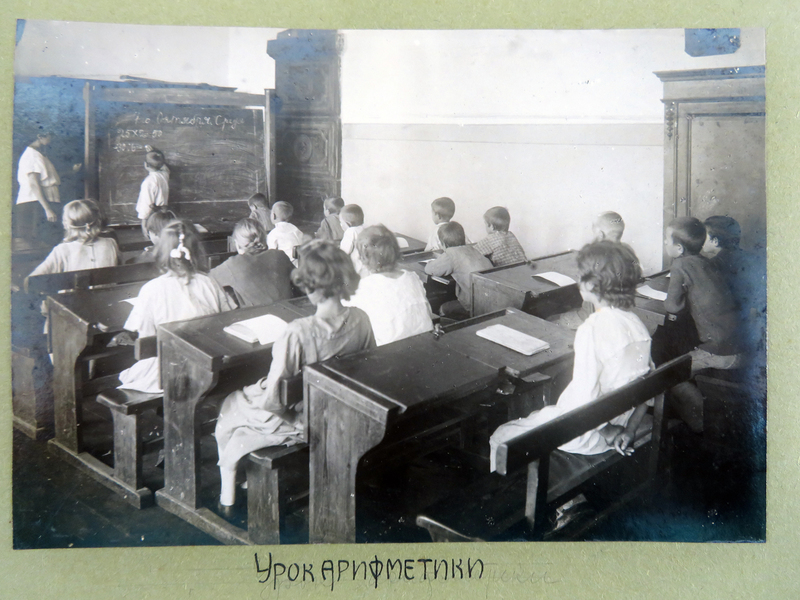 Catalogue of the Cotsen Children’s Library: The Nineteenth Century Published! Were There Picky Child Eaters Before 1850? A Turkey That Don’t Need No Pardon!